It took me awhile to come around to massaged kale. For one, I actually like unmassaged kale just fine. And second, the idea of massaging vegetables sounds just a tad bit, well … creepy. But I’m doing this culinary school thing and one of the early assignments was to try kale three different ways: unmassaged, massaged with lemon juice and olive oil, and massaged with avocado. 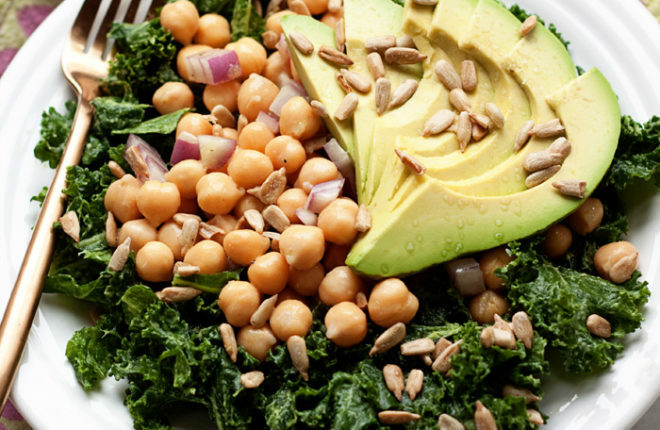 Lo and behold, I had to admit that I really, really adore massaged kale – especially massaged kale with avocado. Creepy vibe and all. There’s the fact that it breaks down the fibers, making it easier to chew, sure. Massaging also takes away some of that bitter “green” taste that some kale-haters dislike (my guy included). And whether you use olive oil or avocado (brilliant!) as your fat, that along with a little lemon juice and salt basically means you’re seasoning/dressing your salad at the same time you are massaging it. A little salad multitasking never hurt. 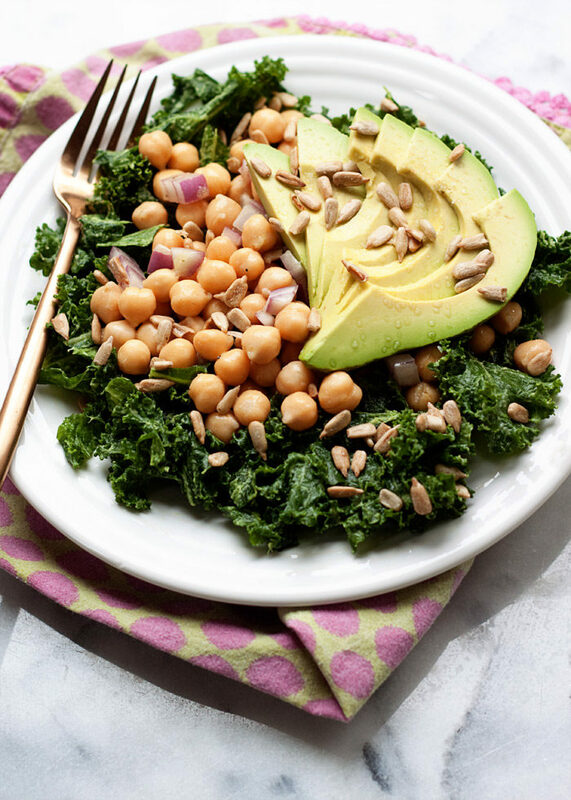 This version massages the kale with avocado, tops it with a simply dressed chickpea salad, and then it’s plopped with a few slices of avocado for good measure. Plus, I like a few sunflower seeds for crunch. I’m a sunflower-seeds-on-my-salad girl. 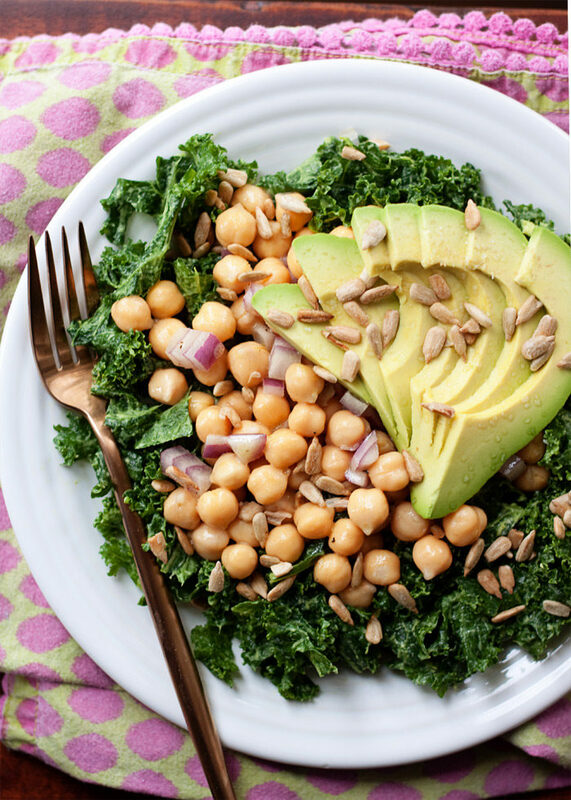 Simple, protein-packed, delicious, easy to assemble, and your kale enjoyed a nice little trip to the spa before you chomp it down. Massaging for the win! Squeeze half the avocado out of its shell and into a large bowl. Mash with a fork. 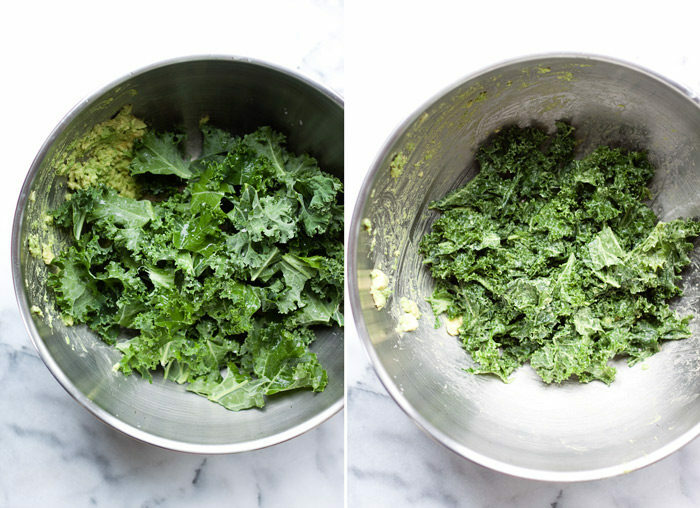 Add the kale, 1 tablespoon lemon juice, and 1/4 teaspoon of the salt. And, with clean hands, dig in! Squeeze and rub the kale until it’s reduced in size and tender, 1-2 minutes. Set aside. To a medium bowl, add the chickpeas, onion, olive oil, the remaining 1 tablespoon lemon juice, Dijon mustard, pure maple syrup, 1/4 teaspoon kosher salt, and black pepper. Stir until well-combined. 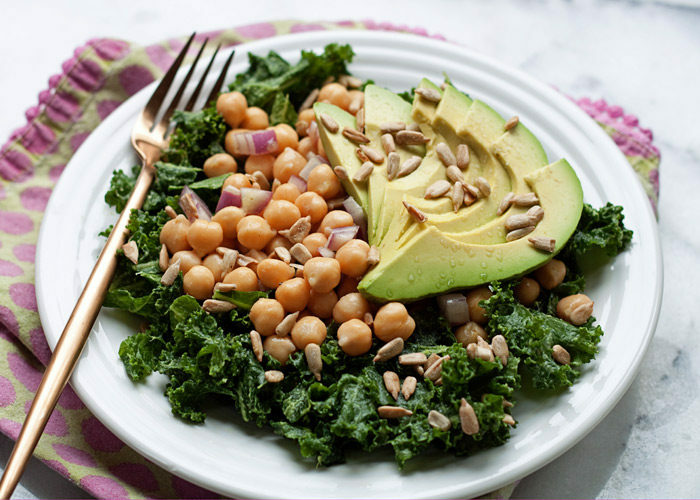 Divide kale between two plates. Top with chickpeas. Slice remaining avocado and arrange on top of the salads. Sprinkle sunflower seeds over the top. Serve immediately. 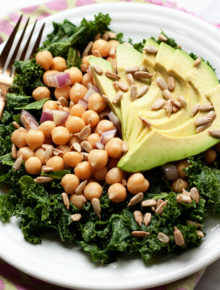 You can make the chickpea salad ahead of time, but due to the avocado and the fact that it usually does not keep well, I recommend doing the massaged kale and avocado right before serving. Top meat-eaters’ portions with some cooked, cubed chicken. Top individual portions with 2 tablespoons each crumbled feta. Excellent recipe. Really delicious and healthy! Isn’t it delish?! So glad you like it. Thanks so much for the nice review!